Since the release of "Blackfish," much attention has been garnered towards the ethics of keeping killer whales in captivity. People are boycotting SeaWorld and pressuring aquariums to release their orcas into enclosed bays where they can retire peacefully. As people make moves to improve the lives of orcas, very few question the morality of using dolphins for entertainment purposes. 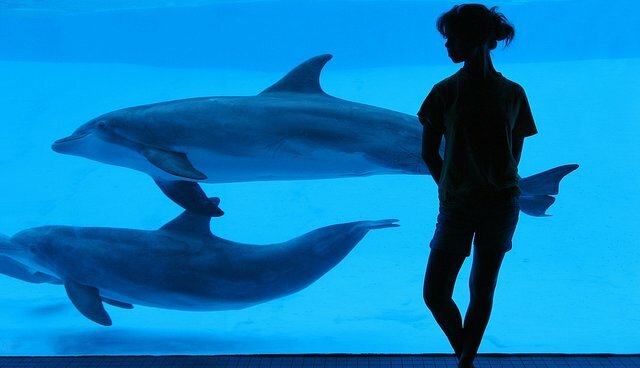 In comparison to orcas, there are far many more bottlenosed dolphins held in captivity. According to Whales and Dolphins Conservation (WDC), by the end of 2014, 57 orcas were recorded to exist in captivity. Researchers have been unable to draw the exact number of how many dolphins are held captive today. However, between 1972 and 1994, 2,300 dolphins were captured according to the US National Marine Fisheries Services. From these numbers, it can be estimated that there are hundreds of dolphins are living in marine parks today (via Whales and Dolphin Conservation Society). Captive dolphins are also scattered throughout the world and are often in countries that do not uphold rules that protect them. In countries like Honduras, dolphin encounter programs allow visitors to swim with dolphins without the guidance of trainers. In Mexico, cameraman Juan Ramírez reported how brutally a dolphin named Quinta was transported to her respective facility. "It's as though they were transporting a piano," he described. Men clumsily dropped the dolphin to the ground and transported her in wooden crates. Quinta would be kept in a pool that would be 15 degrees warmer, shallow and providing little shade (via CNN). Transporting dolphins through the more typical means can also damage their health. Dolphins may suffer from over-heating. Like orcas, dolphins also suffer from emotional trauma when they are separated from their families. With their sophisticated sense of echolocation, they are extremely perceptive to other members of the pod. It provides them with far more information that a human voice could provide. When fishermen attack them, many of them go into cardiac and neurological shock. Often, when captors herd the pods and examine which dolphins to take, they will separate calves from their mothers, especially if they are deemed extremely valuable. A cost for an entertainment dolphin can be between $28,000 and $285,000. While in captivity, dolphins are kept on an empty stomach that way they will be willing to perform during a show. Keep in mind that these behaviors are unnatural and so is their environment. They live immersed in chlorine-bleached waters, surrounded by concrete walls that bounce back any sound that the dolphins may make. This drives dolphins crazy, as they are very auditory creatures. Dolphins are also forced to live in groups of strangers. The groups have been artificially created by humans, and are composed of dolphins of different families and therefore different dialects. Just think of yourself being surrounded in a jail cell with someone that does not speak the same language as your own. The lack of stimuli cause dolphins to experience boredom and the size of the tank - also lack of exercise. To keep them mentally stable, trainers will therefore stick anti-depressants into their food (via Born Free USA). Most people would agree that exploiting dolphins for our own entertainment is wrong. Despite this, people continue to claim that they have healing powers and can help humans in various ways. Most of these therapies are also held in aquariums. Given that its success is unclear, it is unfair to continue engaging in this practice as it supports the dolphinarium industry. A new trend that is also emerging is dolphin-assisted births. There have been many instances in which women tell stories about how they attended a dolphin encounter and female dolphins surrounded their stomachs, being perceptive to their pregnancies. This is unsurprising. A dolphin's echolocation system is keen enough that sound waves reverberating against a woman's stomach would certainly indicate to the dolphin that a baby is in it. Only female dolphins show this behavior, not because male dolphins are unable to do so, but because they are not interested. This behavior has led many people to believe that female dolphins would be good midwives. While engaging in dolphin assisted- births, couples engage with the pod of captive dolphins a couple of months before the birth in order to establish a relationship with them. This can certainly help the couple relax and make the birth of a child less stressful. Still, there are no reasons for why a dolphin-assisted birth would be better than a water birth. Dolphins do not seem to provide any advantage to the birth process (via TIME). It is interesting how people continue to find ways to make dolphins part of our lives. To a certain point, it is understandable. Their intelligence is something we, humans can relate to, and their gregarious nature something we admire. Unfortunately, our obsession with them has led us to exploit them. We should reconsider our similarities with dolphins and question whether our practices are fair. We should stop being selfish and instead use our fascination towards them to do what is best for them. As we question orcas' belonging in captivity, we should also question that of dolphins. The information that has not been cited within this article has been gathered from the "Saving Flipper" documentary.